Understanding copyright – and keeping control of yours – is fundamental to running an effective author business and optimizing your author earnings. 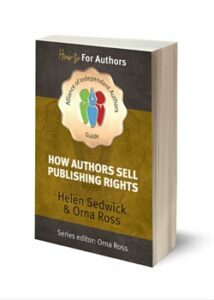 This extract from the ALLi Guidebook, How Authors Sell Publishing Rights, by Orna Ross and Helen Sedwick, provides a useful introduction to the subject. Author income is derived from the copyright in the created work. Copyright law gives you the right to control the publication and other exploitation of the work. You can decide whether to sell those rights, to whom, and on what terms. Typically, rights are sold in the form of licences, and the compensation is in the form of a flat fee or royalties. All authors need to understand the basics of copyright law in order to protect their rights and maximize potential income. “A book is the author’s property, it is the child of his invention, the brat of his brain,” said Daniel Defoe. Copyright law protects “works of the mind,” namely original work of literature, music, film, art, photography, sculpture, architecture, computer programs, databases, and more. In most Western countries, a copyright is created as soon as an author puts the work into tangible form, be it a computer hard drive or a note pad. The bundle of rights owned by the writer is typically called a copyright interest. Registration is not required to create a copyrightable interest: it happens automatically. Without copyright law, anybody could reproduce, translate, adapt or exploit any book without an obligation to acknowledge your interests, issue a license, or pay compensation. We talk more about licenses and royalties below. Copyright has been recognized for centuries and is currently governed by the Copyright Act of 1976 in the US, the Copyright, Designs and Patents Act 1988 in the UK, equivalent legislation in other countries, and international treaties. Generally, an author’s interest is subject to the law in the country where the author resides, or where the work is first published. There is no international copyright. However, due to various treaties, an author’s copyright will be recognized in most countries. The law across the world is similar, but not identical, though different philosophies and terms of protection are found in different countries and territories. Countries that follow the Anglo-Saxon common law tradition, including the UK and the US, classify copyright as a property, which may be sold, assigned, licensed, bequeathed or given away. In Europe, governed by a civil law tradition, droit d’auteur (the author’s right) is a human, rather than property, right. European countries also place far more emphasis on the rights of the creator and on limiting the rights that may be transferred to others. Like your house or car, your copyright interest may be sold, assigned, licensed, given away, and bequeathed. When we talk about “selling rights”, what we’re referring to is authors’ legal right to grant permission (in the form of a license) to others to exploit some of their exclusive rights under the law, such as the right to reproduce the book in print or digital formats, or to translate the work, or to make a film based upon the work. Each right – and there are many – may be licensed in exchange for compensation in the form of a flat fee or royalties (a percentage of sales revenue). Unauthorized use of copyrighted work is almost always an infringement of rights and may entitle the copyright owner to obtain a court order to stop the infringing use and to recover monetary damages. In some cases, willful infringement may subject the infringer to criminal charges. It may surprise you that the very concept of copyright is hotly contested, based on what Kevin Kelly of Wired magazine has called a profound riddle: Who should benefit most from works of the mind, the creators or society at large? On the one side are those who argue strongly that creators must be paid for their work and see copyright as the best mechanism to ensure that they are. On the other are those who believe that, by granting an author (or a large corporation such as Disney) exclusive rights to a work for decades, the law is limiting the free flow of information, education and inspiration. This tension has deepened, as the markets for literary work expand, and technology raises new questions. Not yet a member of ALLi? Visit our membership website’s homepage to find out what joining our global organisation could bring you – free ebook copies of our guidebooks for indie authors is just one of 21 benefits! “Like your house or car, your copyright interest may be sold, assigned, licensed, given away, and bequeathed.” You left out the word “stolen,” and the consequences.